Helena City Hall is located at 316 N Park Avenue, Helena, MT 59623; phone: 406-447-8000. 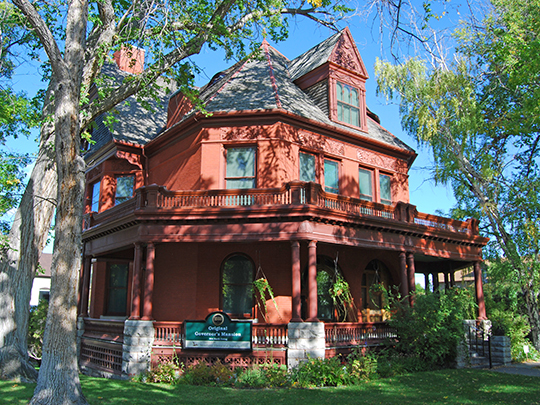 Photo: Montana Governors' Mansion (former), ca. 1888, 6th Avenue and Ewing Street, Helena, MT. Listed on the National Register of Historic Places in 1970. Photographed by User:Parkerdr (own work), 2008, [cc-by-3.0 (creativecommons.org/licenses/by/3.0)], via Wikimedia Commons, accessed March, 2014. Helena, Montana's capital, with its back against low, rounded Mount Helena and Mount Ascension, looks out over the flat and almost treeless Prickly Pear Valley, stretching away golden brown to the foothills of the Big Belt Mountains on the east and to spurs of the Rockies on the north and west. Main Street runs along the bottom of historic Last Chance Gulch, and is somewhat hemmed in; but from almost anywhere else in the city the view is far-sweeping and memorable. In a summer morning, when the sun rises over the wooded Big Belts, the yellow-brown plain, stippled with green fields and ditches, is suddenly awash with light, and the lakes along the Missouri River, a dozen miles away, glow and glisten with color. One of the first cities in the State, Helena is a blend of old and new, with rather more of the old, as age is understood in Montana. Its business streets, narrow and crooked, are adapted to the contours of mountain slopes and furrowed gulches. Many of the buildings have stood as they are for more than 50 years. In the early 1870s the population was nearly what it is today; in the 1890s, when the silver mining boom was at its height, it was larger by several thousand. The demand for new building, except to replace fire losses, has not been great. Some effects of the 1935 earthquakes—cracked and reinforced buildings—are visible, especially on the east side of the city and near the Northern Pacific Railroad station. Many of the residents are employed by governmental agencies—Federal, State, county and city; industrial workers are in the minority. Though Helena, as the seat of State government, with a commission government of its own, is the political center of Montana; it has a tendency to go quietly about its everyday affairs, but business picks up and the streets are thronged on Saturday afternoons when the farmers come to town. In odd years, however, the pattern is violently varied. When the legislature is in session, business booms. Lawmakers, lobbyists, and job hunters crowd the hotels. Restaurants, bars, gambling houses, and night clubs do a land-office business. Helena is "all dolled up," dazzlingly lighted, and gay. Wags try to invent new stories to tell about the legislature, and end by telling the old one about the senator who explained his unaccustomed possession of a large roll of bills by saying that someone pushed it over the transom while he slept. The expression "It came over the transom" to explain any unusual good fortune, is a part of locale folklore. As a supply center the city serves the surrounding mines, the cattle and sheep ranches to the north, the farms of the Prickly Pear Valley, and, to a lesser extent, of the Missouri Valley to the south. The industries include brick, tile, and cement pipe manufacturing. Mining operations employ about 1,000 men; dairy farms and other agricultural activities, a few hundred. Labor is well organized, and union membership is growing. Except for a printers' strike that stopped publication of the two dailies for 5 months in 1934, there have been only minor disputes with employers; businesses are not large enough for management and labor to grow too far apart. There are few foreign-born people in Helena. The original settlers were mainly of English, Irish, Scottish and German descent, and the pioneer families and their descendants still form more than half of the population. Many of the newer arrivals are of Scandinavian ancestry. The Helena region was never the regular abode of any Indian tribes, through the presence of some stone arrowheads and other relics found in the vicinity indicate that it was occasionally visited by Blackfeet and Salish hunting parties. Members of the Lewis and Clark Expedition were the first white men to see the place. On July 19, 1805, the day they discovered the Gates of the Mountains, Captain Clark and a scouting party reached the Little Prickly Pear, where Clark was compelled to stop and pull 17 cactus spines from his feet—reason enough for naming the creek and the valley Prickly Pear. In the fall of 1862, an immigrant train on the Mullan Road halted near what was known as the Three Mile House, about 14 miles north of the present site of Helena. After some discussion and looking around, the newcomers decided to go south into the Prickly Pear Valley and build houses for the winter. Though their "settlement" was only temporary, they were the first people actually to dwell for a time on or near the site of the future city. Helena owes its existence to the gold discoveries in Last Chance Gulch late in the summer of 1864. As word of the strike spread, the miners, between their stints of panning and sluicing, pitched tents and built hasty cabins against the slopes of the gulch. Crude business buildings began to appear. Among the boulders between the uneven lines of shacks, wash by the tailings from the sluices, was "Main Street," the trail by which bull and mule team freight outfits entered the lusty young city. Soon new streets were laid out, and as the spread away from the gulch, the became straighter and more orderly. In October of 1864 it was decided that Last Chance was not a suitable name for the rapidly growing camp. A certain John Somerville dominated a meeting to decide upon a more distinguished name and obtained the adoption of Helena (He-le'-na), the name of his home town in Minnesota. The miners and bullwhackers, however, did not like his way of pronouncing the name; to them "h-e-l" spelled hell, whatever Minnesotans might say. They accordingly shifted the emphasis to the first syllable, and pronounced the name with the second e almost silent (Hel'-e-na). Their pronunciation became the accepted one. It was not until 1870, when Helena was the most important town in the Territory, that a patent for its town-site was issued. Its growth was accelerated by discovery of rich deposits of placer gold in the gulches east of the Missouri; of quartz gold to the south; of more quartz gold at Marysville to the west; and of silver and lead at Rimini, to the southwest. In the late 1870s and the 1880s it was further stimulated by development of the rich silver and lead deposits at Wickes, Corbin and Elkhorn. The city was incorporated in 1881, and was reached by railroad 2 years later. In 1888, when the East Helena smelter replaced that at Wickes, Helena was a great mining center and was said to be the richest city per capita in the United States, numbering among its residents some fifty millionaires. In 1875 Helena became the capital of the Territory, though Virginia City made a strenuous campaign to retain the honor. After 1889, Helena became the temporary State capital, pending an election in which almost every town of importance was a candidate. Works Progress Administration, Federal Writers' Project, Montana: A State Guide Book, Department of Agriculture, Labor and Industry, State of Montana, The Viking Press, New York, 1939.